I bought the Laura Mercier Finishing Eye brush based upon the recommendation of several readers, including Zuzu's Petals from Everyday Beauty. I'm so glad I did. The Finishing Eye brush is not just unique in concept: a duo-fibre eye shadow brush, but also a brilliant performer and quite the multitasker. 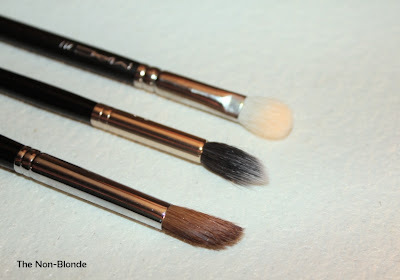 Laura Mercier Finishing Eye Brush is shaped like a blending/crease brush (think Laura's Pony Tail brush) but made of both natural hair and synthetic fibers. The latter are longer, create the tapered shape and are also the ones that come into contact with the product first. That's also the part that does the buffing while the natural hair (goat? pony? I couldn't find any details) keeps the shape and holds the product. Obviously, this is an excellent blending brush to finish an eye look and ensure there are no hard edges and obvious lines even when you use multiple colors. 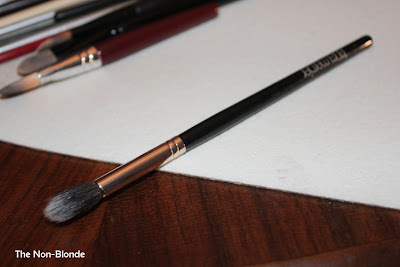 This Laura Mercier brush also fits in the crease and is great for applying dark matte eye shadows that need a light hand, just like you would do with a very pigmented blush and a face duo-fiber brush. Another great use for Laura Mercier's Finishing Eye is for setting powder in small and delicate areas, such as over under-eye concealer. Again, the shape and form help use the minimal amount of powder needed. 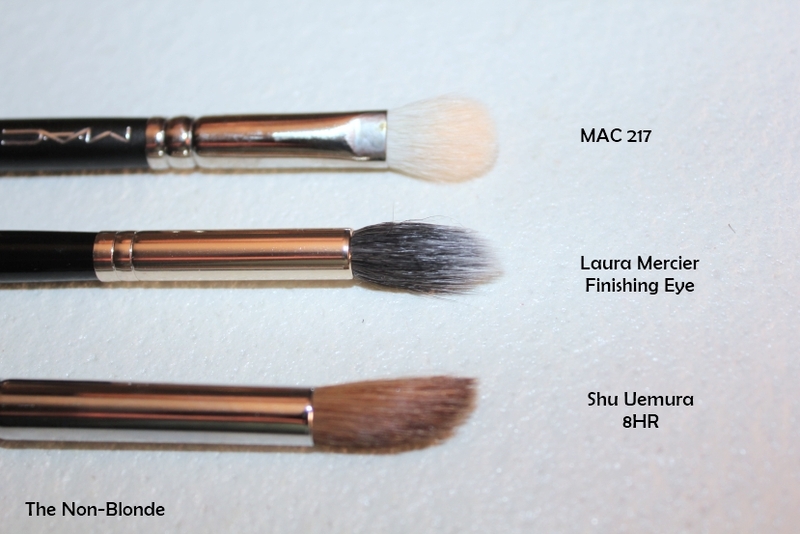 Laura Mercier's brush is softer and more gentle than MAC 217, the classic blending and buffing brush. I prefer the MAC for use with cream shadows and concealer. I consider the Laura Mercier in a similar category tomy beloved Shu Uemura 8HR as both apply and blend eye shadow like nothing else. The different shape makes the Shu better at contouring and smoking out makeup while the Laura Mercier is great at buffing. Laura Mercier Finishing Eye Brush ($32) is available at the counters and from lauramercier.com. I'm glad you like it. 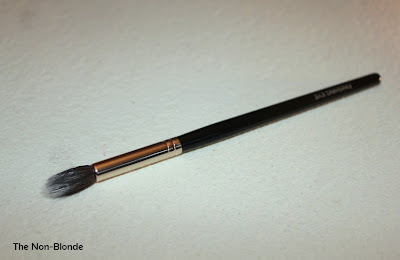 I have about a half dozen Laura Mercier brushes, and this is one I use every day. It's fantastic at putting down a light layer of cream eyeshadows. I prefer to use my fingers, so I don't have to wash a brush, and I need to wash the brush after every cream application (which makes it wear out faster), but my ring finger is a bit too large for inner corner work, and this brush is perfect for that. I absolutely must have this. This is going on the list for our next date. Don't let me go home without it. Z., I'll have to give it another try with cream eye shadows. Once I get a second one. Joey, you have my word: I'll make sure you get this one (and tons of other stuff...). It's brilliant for buffing in concealer, too.